In 2016, Pershore Arts had enough funds to sponsor a project for young people in the arts. Your Committee approached the Art Department at Pershore High School to ask how this might best be achieved. 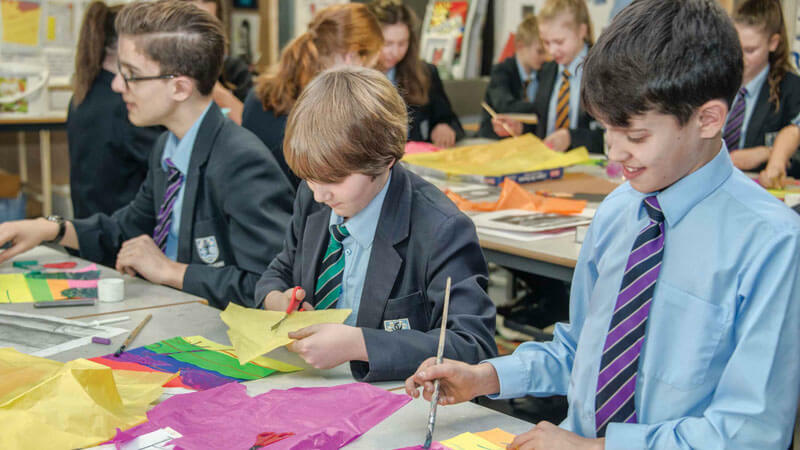 Head of Art David Reed felt that funding for a one-day, artist-led workshop would spread the benefit across the largest number of students; local artist and educationalist Stephen Belinfante was chosen to run the workshop, in December. In the morning, 25 students prepared pencil landscapes and collages. Pershore Arts’ Frans Swarte and Sue Batty attended in the afternoon as the students glued coloured strips of paper onto A4 sheets and used oil pastels to copy their landscapes on top. Coloured tissue paper was collaged in layers over their drawings and finally, bleach was painted on top, following the lines of the original pencil drawings. All watched enthralled as the bleach* bled into the tissue paper to produce interesting abstracts. “The students were totally engaged with the activity and very pleased with the results” said Sue. “It was an entertaining experience for all and lovely	to see the students enjoy being so free in their design work”.